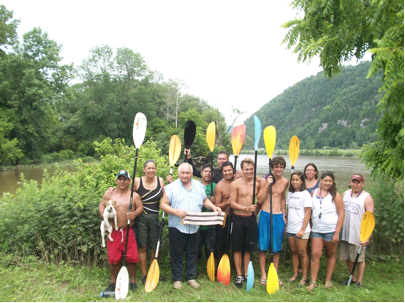 On an epic river journey last summer, over 200 canoe and kayak paddlers celebrated the 400th anniversary of the Two Row Wampum Treaty, the first treaty between the Haudenosaunee (Iroquois) people and early Dutch settlers in what would later become New York State. The paddlers – Native people and their allies – sought to renew the treaty’s vital goals of friendship, cooperation, protecting native lands, and preserving the earth and waters that we all depend upon. Paddlers traveled over 300 miles from Onondaga Lake, down the Mohawk and Hudson Rivers, bringing their message to the United Nations in New York City and sharing it with local people along the way. The Two Row Treaty was made in the early 1600’s and recorded on a belt made of wampum beads which still exists. 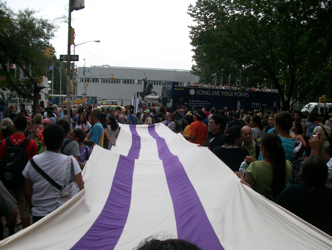 The wampum belt has two rows of purple beads representing the Haudenosaunee in their canoes and the Dutch settlers in their ships, traveling down the river of life together. The Natives and the Dutch agreed that their peoples would live together side by side as brothers, for as long as the grass grows green, the sun rises in east, and the rivers flow downhill to the sea. First paddlers arrive at Kanatsiohareke Mohawk Community near Fonda, NY (July 2013). Mohawk leader Tom Porter holds a copy of the Two Row Wampum. (L-R): Neil Paterson (with dog Huxley Edwards), Shirley Hill, Tom Porter, Hickory Edwards, Noah Onheda, Peter Edwards, Owen Chapman, Cody Edwards, Mistie Shenandoah, Lea Bucktooth, Starlight Edwards, John Jocko. On this trip, the paddlers lined up their vessels in two rows on the river, to embody the treaty’s message of traveling through life side by side while respecting each other’s independence. During rest stops, the group drifted together, sharing stories, jokes, and laughter – and some friendly splashing and water fights among the younger crowd. The group paddled downriver between eight and eighteen miles per day, camping overnight in parks and riverside campgrounds, together with a road crew of up to a hundred supporters and family members who cooked, moved the heavy gear, and managed all the logistics. 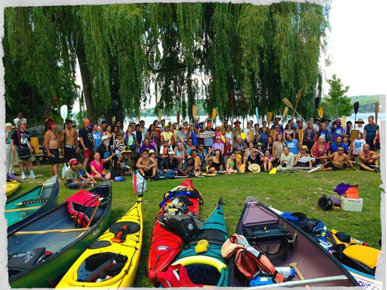 The main organizers of the journey were from the Onondaga Nation, including the lead paddler, Hickory Edwards, and Neighbors of the Onondaga (NOON) led by Andy Mager. 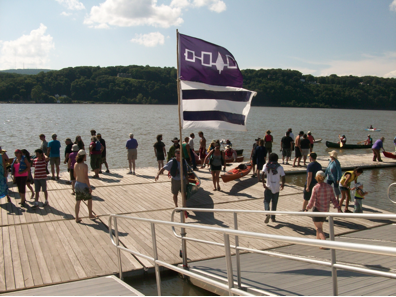 About half the paddlers were Haudenosaunee (Mohawk, Oneida, Onondaga, Cayuga, Seneca, and Tuscarora) along with people from more than a dozen other first nations. Neighbors and allies were just as numerous, including people from across the US and Canada, from the Netherlands and other countries. At the start of the Hudson River journey, Mohawk spiritual leader Tom Porter gave the traditional Haudenosaunee Opening Address, thanking the Creator for all of the things in the world that truly matter. Onondaga Clan Mother Freida Jacques described the discipline of the Good Mind (Kanikon:rio) and how paddlers could use it to keep on an even keel and overcome adversity. As rain fell, she reminded everyone that the river and weather made it very clear who is really in charge here on earth – and it’s not us! After a rough first day on the river, the sun came out and the paddlers enjoyed several days of warm weather, smooth water, and tides that sped them on their way. Paddlers taking a break on the Hudson River near Catskill, NY (August 1st). 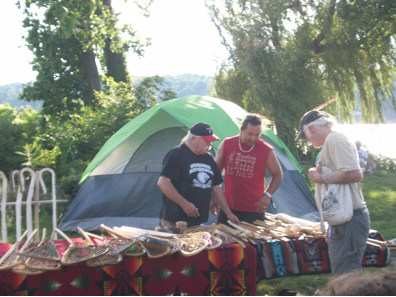 At the campsites every evening, the public was invited to attend events and hear talks about Native cultures, the Two Row campaign and its message. Music and traditional social dances were held several nights and enjoyed by all. At one site (the half-way point in the Hudson River voyage), as many as two thousand local people turned out to greet the paddlers, at the Walkway over the Hudson in Poughkeepsie, NY. Lunch time! 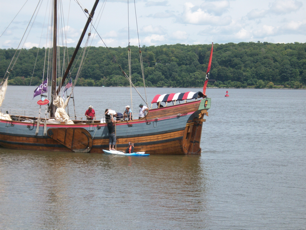 Pizza delivered by kayak, to the Dutch replica sloop, Onrust, near Saugerties NY. 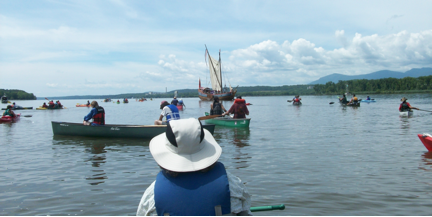 Paddlers arriving at Poughkeepsie, August 3 – halfway down the Hudson. Through sun and rain, the paddlers, young and old, stayed on course and kept to their schedule. After many adventures, on day 13 of the Hudson trip (August 9) they arrived in force at Pier 96 on the West Side of Manhattan, to the cheers of a huge welcoming crowd. The Dutch Consul General, Rob de Vos, greeted the paddlers and made a moving speech, thanking the Haudenosaunee for welcoming the Dutch 400 years ago and for teaching them how to survive in this new world. Smoking a pipe with the Haudenosaunee chiefs, Mr. de Vos reaffirmed the Two Row treaty, and invited the leaders to visit the Netherlands, for a similar ceremony later that summer. Finally, the paddlers marched across Manhattan to the UN, where Secretary General Ban Ki-moon welcomed them to a special conference for the Day of Indigenous Peoples. At the conference, UN officials and member state representatives spoke at length about the UN’s role as a peace-maker, which includes being an arbiter and champion for treaty rights. Oren Lyons, the leading Haudenosaunee diplomat, eloquently described the Two Row Treaty as a foundation for all subsequent treaties, most of which have been violated by the US and Canada. Other speakers, including the UN Secretary for Human Rights, clearly stated that the UN would work to redress treaty violations, treating them as human rights violations, and that broken treaties will become a thing of the past. Final destination — Paddlers arrive at the United Nations, August 9th 2013. After a triumphant journey’s end in New York City, many of the Two Row paddlers found it hard to say goodbye to their new friends. 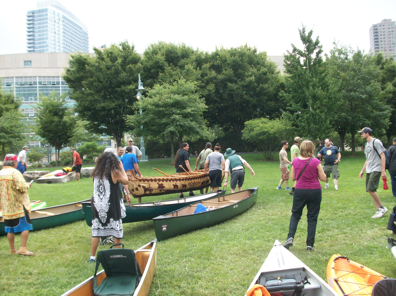 Since then many have kept in touch and are starting to share ideas for future plans, including more canoe journeys. Some discussion is now underway about possibilities for trips across western New York State and down the Susquehanna River, perhaps going as far as Washington DC. Two Row group photo, Peekskill NY – August 5, 2013. 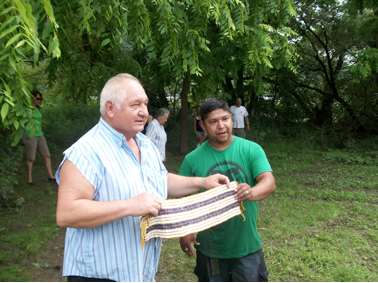 Tom Porter, Mohawk elder, and Hickory Edwards, Onondaga lead paddler, with the Two Row Wampum. 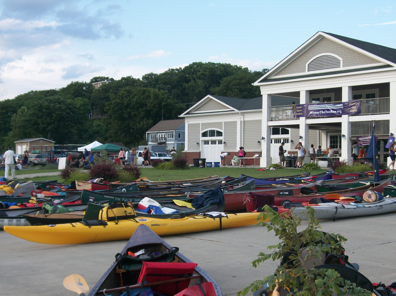 Two Row campsite at the Hudson River Rowing Association in Poughkeepsie – evening of August 3rd. Alf Jacques, lacrosse stick maker, discusses all the types of sticks and how to create them. Canoes arrive at New York City, August 9th. 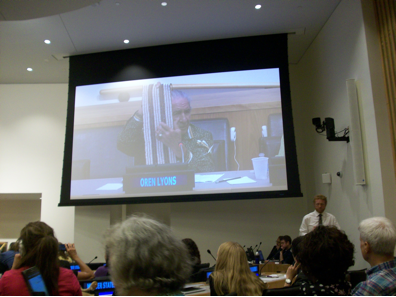 Onondaga Chief Oren Lyons presents the history of the Two Row Treaty at the United Nations. 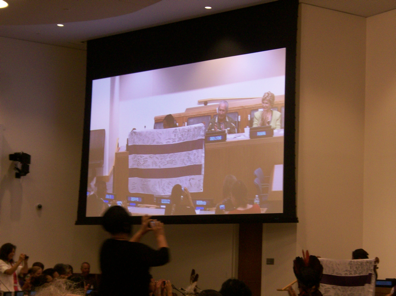 Two Row banner, signed by the paddlers, is presented to the United Nations, August 9, 2013. Thank you, Paul, for an inspiring and accurate retelling of the Two Row journey. Thank you for this wonderful retelling of this extraordinary event and journey down the rivers. Treasure all the peoples I met.